A viewing suite, recreational modules, clean trouser legs, champagne flutes… it can only be the brand-new Rolls-Royce Cullinan SUV. You may have heard a thing or two about a new Rolls-Royce launching, and here it is, the Cullinan SUV. There’s been a lot of talk of the Cullinan. It was first announced three years ago that Rolls would be jumping into the SUV world. But this is Rolls-Royce, so you knew it was never going to be any old car. Rolls-Royce has never shied away from size, but now they’ve gone up (it’s 1,836mm high), as well as out, with the launch of a brand-new model. As it’s an SUV though, Rolls-Royce is keen to show that despite the luxury, this is a car you can take off-road too. Rolls-Royce wanted to bring its ‘magic carpet ride’ sensation to off-roading, as well as on-road. As well as the light but strong body, it also has self-levelling air suspension, which reacts to body and wheel acceleration, steering inputs and camera information. 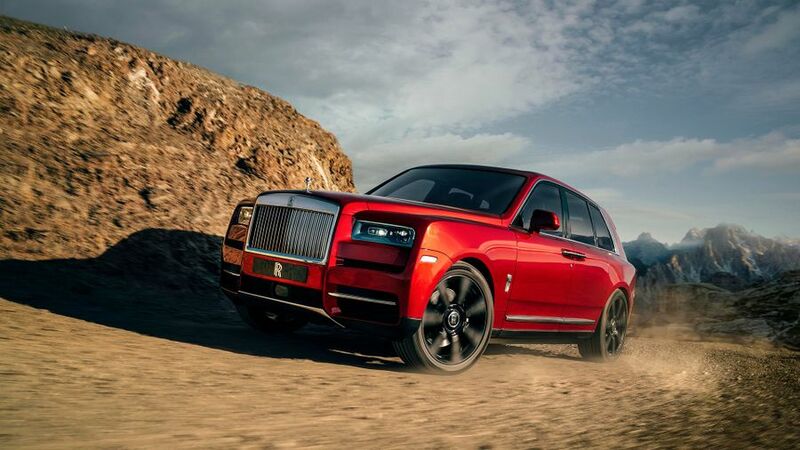 If you’re planning to get your Cullinan dirty, all you have to do is push the ‘Everywhere’ button to unleash the car’s off-road capabilities, whether you’re on snow, sand, wet grass, mud, or gravel. It also has a wading depth of 540mm. 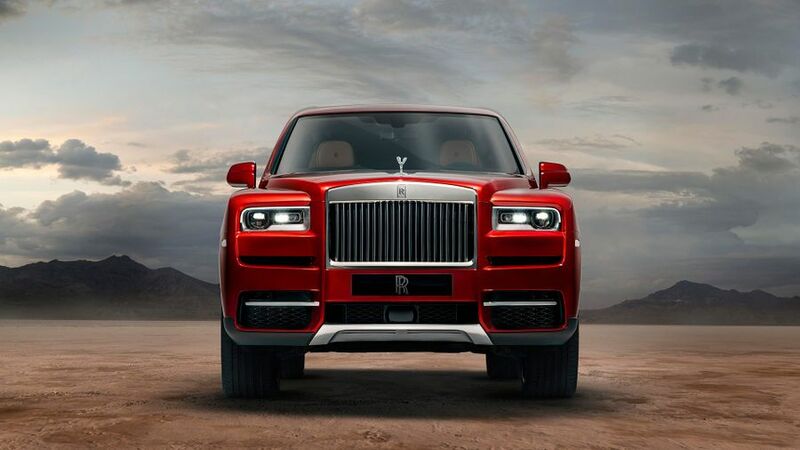 We’ll leave it up to you to decide if the Cullinan looks like it has the ‘commanding stance of a warrior’. It certainly looks powerful though, with the lights and air intakes deep set into the body work, and lots of strong lines all over the place. The grille is hand-polished stainless steel, and the laser-light system casts light more than 600 metres down the road. The car is built using Rolls-Royce’s ‘architecture of luxury’, which means it has an all-aluminium spaceframe architecture. It was first used on the new Phantom, launched in 2017, and is 30% more rigid than the previous Phantom. Rolls-Royce can scale it to the size and weight requirements of its different models, so it can be used across the range, and says it is the reason Rolls-Royce cars deliver impeccable ride, acoustic, and seat comfort, exterior presence, interior space, and usability. The Cullinan is higher, but shorter than the new Phantom. And for the first time in a Rolls-Royce, it has a tailgate. And what’s under the bonnet you ask? Well, just a casual 6.75-litre twin-turbo V12 with 571 horsepower. So this thing will shift. It’s paired with an eight-speed automatic gearbox. What’s the inside of the Cullinan like? 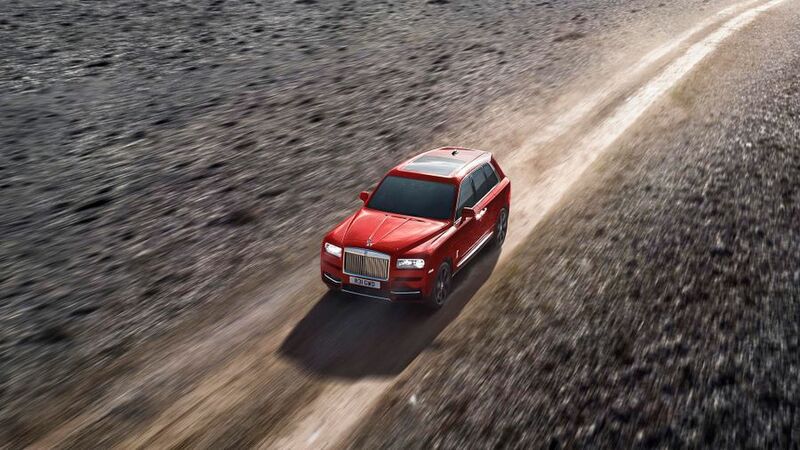 As you approach the Cullinan, it lowers itself by 40mm to make getting in easier. Once you’re in your seat, just press the door closing button and they’ll shut for you. When you start the engine, the Cullinan returns to its original height. 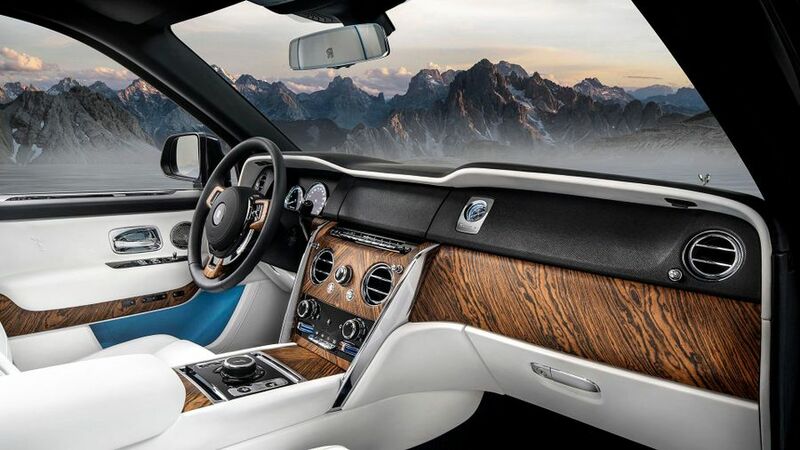 Inside, the Cullinan is of course typical Rolls-Royce luxury, with the finest leather, wood and metal. Some of the areas in your eyeline are clad in ‘box grain’ black leather, which is often used in Italian high-end luggage and handbags. The seats are of course leather as well, and feature a simple horseshoe graphic, to emphasise the supportive bolsters of the seat. The relatively small steering wheel is heated, of course, with heated and ventilated seats as well. It doesn’t stop there though… so you don’t accidentally touch something cold, the front door armrests, front centre console lid, lower C-pillar, rear side and centre armrests are all heated too. The driver display is digital, showing speed, power reserve, fuel, temperature, as well as cruise control, navigation, driver assistance systems, and infotainment information. For the first time in a Rolls-Royce, the infotainment screen is a touch-screen. But you can still control it with the Spirit of Ecstasy controller in the central console. Other technology on offer includes: an alertness assistant; four-camera system with panoramic, all-round visibility and helicopter view; wildlife and pedestrian warning; active cruise control; collision warning; cross-traffic warning; lane departure/change warning; head-up display; wi-fi hotspot; and loads of entertainment kit. Those in the back will have a decent view out, sitting higher than those in the front. Rear seat passengers also have their own rear touch-screens, and can deploy the rear-seat picnic table at the touch of a button. 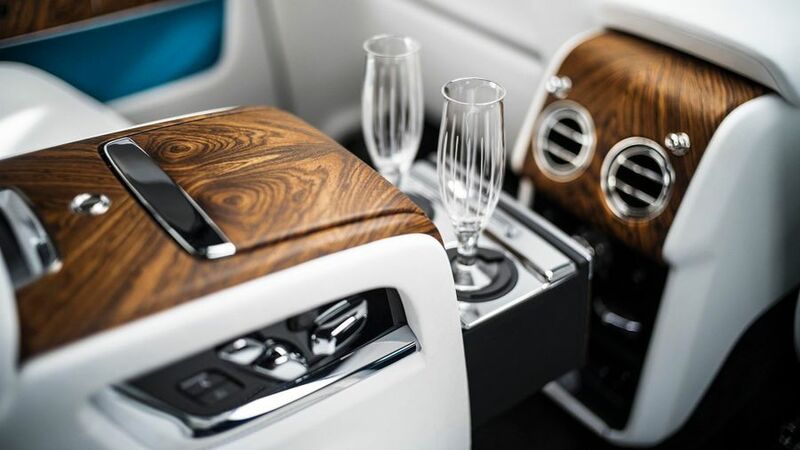 The two individual rear seats are separated by a drinks cabinet with Rolls-Royce whisky glasses and decanter, champagne flutes and a cool box. The seats have also been angled so the two passengers in the back can have a conversation with each other, without straining their necks. A glass partition isolates the passenger cabin from the rear compartment, so you never have to be with your luggage while travelling (apparently this was a thing in the past). The glass partition also helps regulate temperature though, and ensures passengers are always warm or cool enough. There are five USB ports around the cabin, and a wireless charger in the front. When it’s time to get out the car, Rolls-Royce appreciates that no-one is going to want a muddy trouser leg, so the front and rear doors wrap low under the sill, so no dirt will get on it, and consequently on you. If you’d rather watch than take part, there’s also the Cullinan viewing suite. Just push a button, and two rear-facing leather chairs and a cocktail table emerge. Rolls-Royce suggests it’s the perfect place to view an equestrian event or watch your child take part in their school sports day. Naturally. In another first for a Rolls-Royce: the rear seats fold down. Either split 2/3, or 1/3, you just have to press a button in the boot or rear door pocket, which also conveniently moves the headrests upwards. If there’s only one passenger in the back, you can fold one seat down and have a practical table top. The boot gives you 555 litres of space, or 600 with the privacy cover removed. With both rear seats down, the loading length is 2245mm, which Rolls-Royce says is longer than the space in the Volvo V90 and Mercedes-Benz E-Class Estate, with 1930-litres of space in total. If you don’t have many hobbies and don’t fancy the ‘recreation module’, the boot floor will raise up at the touch of a button to make for easier loading. We're not sure how much the Cullinan is going to cost, or when you'll be able to get your hands on it. But we suspect it's going to be a case of if you have to ask, you probably can't afford it. Interested in buying a Rolls-Royce ?